Welcome to MAP! The Mooresville Arts Partnership is now in it's 9th year of programming. Visit our schedule and online registration to join a new class for the Winter/Spring Semester and #JumpstartJanuary with us in 2019. Classes begin January 7th and will be open for enrollment until classes are maxed. Our not for profit arts center offers a variety of classes and workshops in both visual and performing arts. Stop by 697 Indianapolis Road, Mooresville, INDIANA to explore the arts. DANCE, TUMBLE, & CHEER classes - We offer classes for all ages and styles, including Ballet, Lyrical, Pointe, Hip Hop, Jazz, Musical Theatre, Contemporary, Modern, Acro, Tumble, Cheer, Ballroom, & Tap. Mooresville Arts Partnership is home to the National Award Winning MAP Competition Dance Team. ART classes & workshops - From students to professional, we have the options for you. Paint, draw & create. Youth Art, Teen & adult instructional classes & guest artist workshops are available for all levels. Explore the art gallery or drop in for the Life Drawing Co-op. MUSIC lessons - Study Piano, Guitar, Voice, Cello, Electric Bass, Double Bass, Violin & Viola with private lessons. Join the youth choir, group musical theatre or cabaret class. THEATRE classes - Youth Theatre classes have brought a wide variety of plays, skits and musical productions to life, including The Apple, Alice in Wonderland, Annie, Into the Woods, Wizard of Oz, Sleepy Hollow, Cobweb Dreams & Thoroughly Modern Millie. Our Theatre group's next big adventure is now casting. Students of all disciplines are given opportunities to showcase their talents at student Art shows, Second Saturday events, Coffee House shows and Recitals. We offer over 100 different programs in Art, Music, Dance, Drama, & Tumble. Classes are affordable and fun. 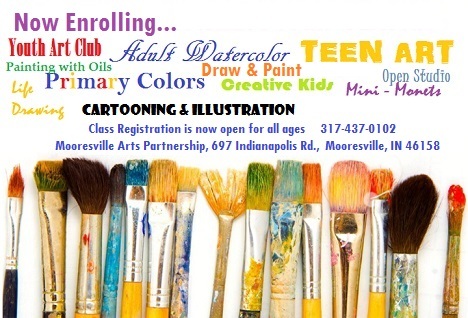 We're now enrolling at the Mooresville Arts Partnership, 697 Indianapolis Rd., Mooresville, Indiana 46158. Call 317-437-0102 for more information.